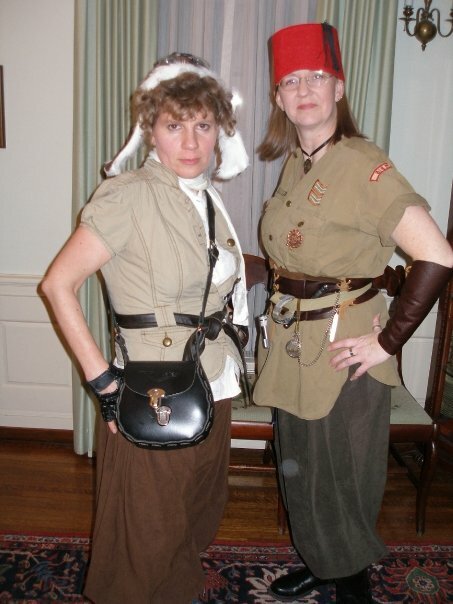 Earlier this year we did a Steampunk Thrift to Fashion review of a Steampunk fashion show that the Wench Posse did. As we draw closer to the Steampunk Christmas Carol Event we have happening on Dec. 3rd (read more about it HERE), I thought it might be worthwhile to do another posting on finding Steampunk items in your closet or the local thrift store. Many items can be used as is, or with simple modifications. Most outfits usually are a mix of found and made/modified items. This outfit uses a mix of items. The leather jacket and blouse were thrifted, as was the Brownie camera which Chelsey here is using as a purse. The skirt was made using this tutorial from Katafalk. 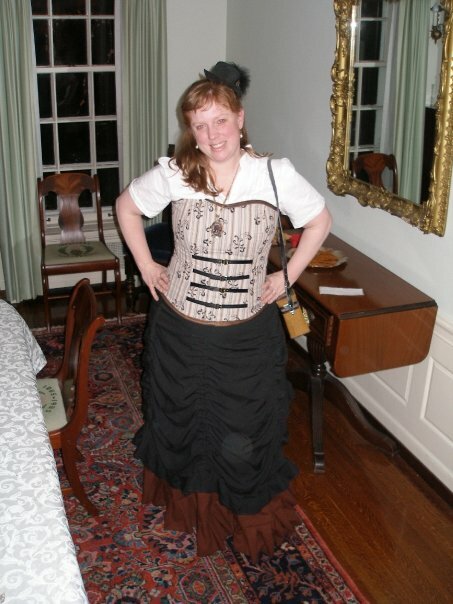 The corset was made using the 2966 Simplicity pattern. The hat was based off of a tutorial on Threadbangers. All of the jewelry (to include the eyebrow piercing!) were made using items found at Ax-Man. Both of these outfits also use a mix of techniques. Ellen’s outfit on the left includes a thrifted blouse, a borrowed scarf, bag and boots, and her own motorcycle gloves and wrench. The bloomers were made using a self-drafted pattern, and the hat was also made from scratch. 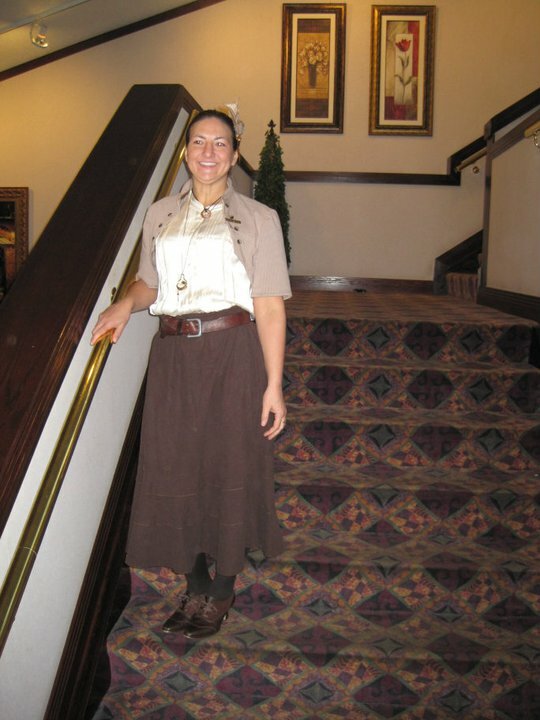 Renee’s outfit consists of a borrowed fez, a modified Boy Scout shirt that she found at the thrift store, bloomers she made, and her own boots. She made gauntlets from leftover leather scraps, as well as a leather waist cincher. All jewelry was either made or thrifted. 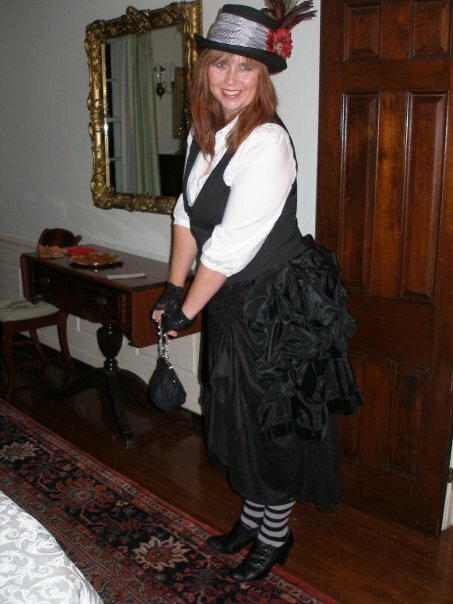 This outfit is different in that it was almost exclusively sewn. The blouse and bag were thrifted, as were the boots. But the corset was made using fabric and leather and an out of print pattern similar to the 2953 Simplicity pattern. 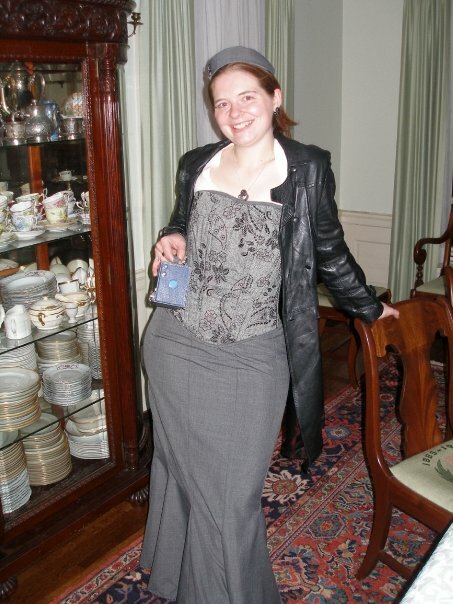 The skirt was made of two layers of linen using Katafalk’s “How to sew a Victorian skirt” tutorial. And finally we come to Nell, who is also wearing a mix of items. The pants are a split skirt that was made using this pattern from Laughing Moon. The blouse was thrifted, as were the shoes. The necklace was purchased online. The bolero jacket was thrifted as a Blazer, and modified to look like a Bolero. Hopefully these examples will help you to look at the items in your closet (and at the thrift store) with an eye to using them for costuming. There are many retro-Victorian pieces from the late 70’s through the early 90’s out there, as well as some from vendors today. Keep your eye out for true vintage as well. Also use online resources like Threadbangers, Katafalk’s blog and You Tube for tutorials on how to modify things you own or find. So stop looking in your closet with frustration and start looking in there with inspiration! 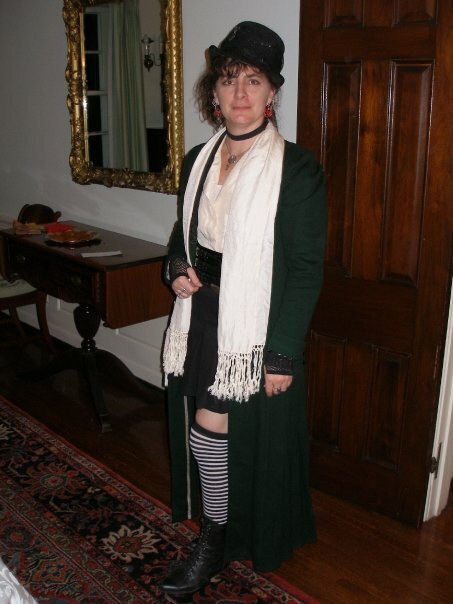 We hope to see you attired in your finest Steampunk garments at the Steampunk Christmas Carol on Dec. 3rd!